News and announcements regarding the hvac-connect.com website, features and functionalities. Along with the increasing popularity of HVAC-Connect.com, we have been receiving and increasing amount of requests from companies trying to add their business listing on the website. Although this is amazing news, the downside is that the waiting time for our manual inclusion using the Free Plan has almost reached one year now. In order to limit the waiting time, we had to replace the Free Plan with a Basic Plan costing only $19 for 2 years. This small amount will allow us to cover the cost of manually validating each listing while sustaining the growth of HVAC-Connect.com. Although prices for the Bronze, Silver, Gold and Platinum plans remain the same, we have doubled their duration, from 1 year to 2 years. In other words, you only need to renew every 2 years and you get twice as much for your money. What if you had the option to show your ad in your competitors’ listings for only $69 per month or $599 for a whole year? Now you do, at least for a limited time. The new Listing Banner Ads on HVAC-Connect.com will show in the detail page of every listing published with a Free Plan or Bronze Plan. That’s on every listing page, including your competitors. Also, since we are launching the Listing Banners with only 10 spots available, this means your ad will be shown every 10th time a Listing Banner Ad appears, which implies that your ad also has a 10% chance to pop up every time a potential customer views one of your competitor’s listing page. And we’re not talking about the sidebar here, we’re talking right in the middle of the page, below the title and above the description. Please note that listings published with a Silver, Gold or Platinum plan don’t have any ad showing on their detail page, so your competitors with such plans will be protected. It might be a good idea to make sure your listing is safe from competitors’ ads as well. We’re so excited that we almost forgot to mention that Listing Banners Ads also appear in business categories and search results! Again with the same 1/10 rotation system. Last but not least, by subscribing to monthly or yearly renewals now, you will secure the current pricing against future increases for as long as your subscription lasts. And you can cancel your subscription anytime, so there’s no commitment other than the current month or year you’ve already paid for. What you get for $69 per month (or $599 per year)? Your ad on your competitors’ listing page, 1 time out of 10. Your ad on your all other listing pages, 1 time out of 10. Your ad in business category pages, 1 time out of 10, 4 ads per page. Your ad in search results, 1 time out of 10, 4 ads per page. The spot is yours and initial pricing is protected as long as you keep renewing. EDIT: We are now manually reviewing and approving each new listing. The approval process can take weeks or even months for the Free Plan. Premium plans (Bronze, Silver, Gold and Platinum) include a 48 hours rapid approval. We’re sorry to announce that we had to add a one-time setup fee of $10 to our Free Plan due to some abuse. The Free Plan remains free of yearly charges. We hope $10 won’t stop serious HVAC-R and Plumbing companies to add their listing on the #1 HVAC-R and Plumbing business directory. After all, how ridiculous would it be to leave numerous customers to your competitor because you wanted to save… $10? Unfortunately, a so-called SEO expert company representing multiple HVAC contractors have abused our Free Plan and cluttered the site with multiple duplicate entries just to plug in their keywords prix boite de viagra. We tried to contact the company using this tactic – which by the way is called Black Hat SEO and can be severely penalized by Google – but nobody returned our calls nor emails. The Free Plan was offered in good will to let companies try our platform and hopefully upgrade to advanced plans as they see positive results from the free plan. Unfortunately, this good will ended up costing us hours of work to clean up the mess this company created. It is also notable that we nicely posted their promotional video for free on HVACR.TV a few weeks ago. No need to say that we’ve just removed it. Last but not least, as soon as we added the $10 charge, that so-called SEO expert company stopped in the creation process of its new listing. They wouldn’t pay $10 to list their customer’s business on a top quality business directory, even though they are probably charging the same customer thousands of dollars per month to do that job. Thank you CI Web Group! HVACR.TV is the first and only video website 100% mobile and dedicated to Heating, Ventilation, Air Conditioning, Refrigeration and Plumbing. The HVACR industry now has its own YouTube. All kinds of HVAC, Refrigeration and Plumbing videos are posted on the website and sorted by categories: News, How To Videos, Product Videos, Corporate and Brand Marketing Videos, Funny Videos, Training and Education, Software Presentation and Tutorials, and more. When landing on the homepage, HVACR professionals quickly find featured videos, the ones that have been viewed and liked the most, and the most recently added videos. HVACR.TV is an open platform and is entirely free. Companies and users can register and add their own videos. Videos are manually approved to ensure content and film quality. It is possible to advertise on HVACR.TV. Monthly and annual plans are available. It could be wise to purchase a yearly Ad Plan now as the price is still affordable and quite likely to go up as the site’s popularity grows. Video marketing is very powerful and HVAC Marketing Hub is providing the industry with another free and efficient marketing tool. The HVAC Marketing Hub division of Tuobdog Inc. publishes the popular HVAC-Connect.com business directory, the efficient Job Board HVACJobsCenter.com, the news source HVACPlumbingNews.com and the Deals and Coupons website HVACPlumbingDeals.com. <img class="alignright size-medium wp-image-4370" src="http://hvac-connect.com/connect/wp-content/uploads/2014/11/NewPricing2014-11-25-230×230.jpg" alt="NewPricing2014-11-25" width="230" height="230" srcset="http://hvac-connect viagra 100 g.com/connect/wp-content/uploads/2014/11/NewPricing2014-11-25-230×230.jpg 230w, http://hvac-connect.com/connect/wp-content/uploads/2014/11/NewPricing2014-11-25-80×80.jpg 80w” sizes=”(max-width: 230px) 100vw, 230px” />If you’re reading this now, there’s no reason for you not to seize this opportunity. Not only have we just lowered our pricing, but an extra 20% discount coupon is also available on HVACPlumbingDeals.com. It has never been cheaper to advertise your business in front of thousands of visitors per month, either HVAC-R and plumbing professionals, or consumers looking for HVAC, refrigeration and plumbing products or services. HVAC-Connect.com business directory is the ultimate affordable, targeted and efficient marketing tool for your business. For more information about our various plans and pricing, visit our Plans and Pricing page. Google released a new update on July 24th, nicknamed “Pigeon” by Search Engine Land. According to experts, this recent algorithm change gives better rankings and visibility to local directory sites and listings in search results on Google. Experts recommend companies to make sure that they appear in directories like HVAC Connect and that they get great visibility and good customer reviews. We hate SPAM, we’re sure you do to. We ourselves receive each day dozens of unsolicited emails. That’s why we made sure to be diligent not just to meet the email privacy laws, but to exceed them. We have recently moved to a new server and upgraded our email opt-in policy to exceed the new email privacy laws. We value our clients and contacts, and actively protect your privacy. We want to make sure that you really want the important news and valuable offers that we send, so I’m asking for your permission. Our new HVAC-Connect.com News will exclusively be sent to our permission-based list acheter viagra soft. We don’t want you to miss out on these great details, so we want you to subscribe now. Thank You Gifts and Draw for Subscribers! Also, to thank our new and remaining subscribers, we will offer new exclusive rebates to everyone and draw 10 of our new Platinum Plans ($1499 value each), $15,000 Total Value. We promise to only send you emails when we really have something interesting to communicate. And if you decide not to take up on this offer, HVAC Connect will remove you from our subscription list completely. So subscribe now to HVAC-Connect.com News. We know that you’ll find our promotions, news and tips handy for your business and for yourself. Most of you must have heard about the Heartbleed bug by now. If not, you definitely must read this article. Many experts have rated the Heartbleed bug 11 out of 10 on the security breach scale. To first understand what Hearbleed is, you can check out this article on Wikipedia or this dedicated, although more technical website. 1. We don’t use the OpenSSL protocol. OpenSSL is used on secure websites – their address starts with https . Because our site doesn’t use nor keep any sensitive information, we use the standard http protocol. 2. Does that mean your site isn’t secure? We use a lot of advanced tools to protect our website from possible attacks. That being said, the only information we have on you is your name, email address, encrypted password and your company listing information, which is public anyways. In other words, a hacker would be very disappointed if he managed to breach our security! The worst he could achieve would be taking down our site or modify your company listing. In both cases, we could fix everything very quickly and easily by restoring one of our regular backups. 3. What about payments? If we were using or storing your credit card information, we would use the OpenSSL protocol… and this article would be a different story. But we redirect all our users to PayPal’s secure website for payments. PayPal use the secure OpenSSL protocol to process your transaction, then only lets us know if your transaction was successful or not. We do not handle any bank or credit card information directly. 4. If PayPal use OpenSSL, then THEY can be affected by Hearbleed! This article on Mashable lists all major websites, if they were affected and patched, and if you should change your password on these sites. As per this article and many others out there, PayPal is not affected by Heartbleed. Here’s also Paypal’s Press Release in the PayPal Community. 5. But I see Facebook, Twitter and Google on that list. I use one of these to connect to your site! Don’t panic, all we’ve got is the authorization to read your public profile and posts. When you log in with Twitter, Facebook or Google (or even LinkedIn, which isn’t affected), we only receive confirmation that you’re really who you say you are. We can in no way access your private information, modify your profile or post something for you, we don’t have the access rights. So you have nothing to fear on our side. That being said, if you do have a Twitter, Facebook or Google+ account – or any account on that list – , we highly recommend changing your passwords now. But rest ensured that your account on HVAC-Connect.com is safe. We hope you found this article useful and now feel reassured about your HVAC-Connect.com account. Please don’t hesitate to share with your friends and colleagues. Comments Off on HVACJobsCenter.com Up and Running! HVACJobsCenter.com lists exclusive offers along with external offers appearing on other sites. No need to waste precious hours searching multiple generic sites for duplicate job offers and jobs in non-relevant fields. Find all the best HVAC Jobs, Refrigeration Jobs and Plumbing Jobs in one single place. 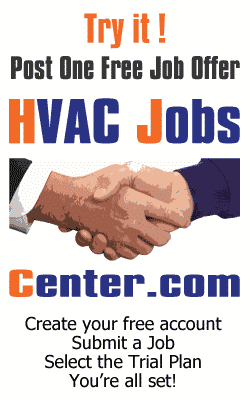 HVACJobsCenter.com is also an ideal employment site to post HVAC, Refrigeration and Plumbing Job Offers. Speed up and optimize your recruiting process by posting your job offers on a specialized website. Generic Job Posting Websites are checked by all job seekers. Some of them are desperate and would apply to almost any job even though they lack proper experience and qualifications. HVACJobsCenter.com is targeting Professionals of the HVAC, Refrigeration and Plumbing industry only and therefore greatly reduces the percentage of unqualified applications, saving recruiters some precious time. You will also find HVACJobsCenter.com‘s dashboard very efficient. Create your Employer or Recruiter profile and post your job offers in minutes. Receive applications online, manage your company profile and your job offers in our user-friendly dashboard. Each job posted on HVACJobsCenter.com is shared on all major Social Medias, immediately reaching thousands of qualified candidates. Our job posting cost and plans are very competitive, yet we’d like you to try the site for Free and see for yourself how you like it. Employers and Recruiters, register now and post your first job offer on us!